A pre-election political rally in Kenya. Photo by Thom Pierce. A stunning photograph speaks for itself, but there’s always more to the story than meets the eye. We spoke with British photographer Thom Pierce, who is currently based in Cape Town, South Africa, about this striking image, which he took at a pre-election political rally in Kenya. Subject: A tribal procession in Turkana County, Kenya. Takeaway: Be really obvious with your actions and give subjects the opportunity to move out of the shot if they feel uncomfortable. This shot was taken during a pre-election political rally in Turkana County, Kenya, in June 2017. It was also Madaraka Day, the public holiday that celebrates Kenya attaining internal self-rule in 1963. I was working on a project to promote inter-tribal peace during the elections, a time when tribes are often pitted against each other for political benefit. 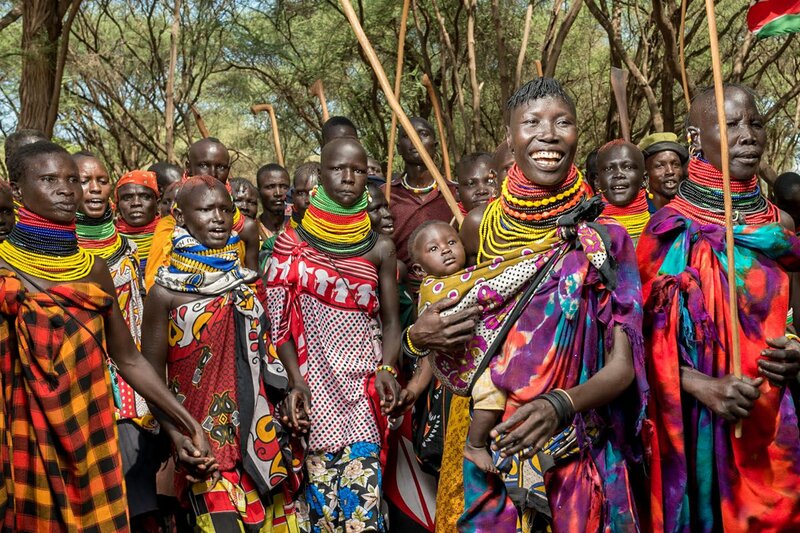 We had traveled up to Turkana to photograph examples of inter-tribal unity in various small villages. On our way, we got stuck in a procession with thousands of people, divided into two political parties, marching and singing. We couldn’t get through, so we decided to join. I like to work with lights and I like to light people. In my work, it’s really important to me that you can see people and read the subtleties of their expression and mood. When we jumped out of the car, I set up my Nikon D800 camera with my strobe wireless trigger and a 35mm lens that I knew would give me the best chance of capturing the atmosphere. I put a Profoto B1 light on a stand and secured a shoot-through umbrella onto it with tape, safe in the knowledge that we were probably going to break the umbrella. I probably should have used a B2 for this, as they are smaller and more manageable for walking around, but I didn’t have one with me. We walked into the crowd. I asked my assistant to stand to my side to try and keep the umbrella out of the picture and to point it at whomever I was pointing the camera at. Instead of freaking people out by walking up to them, we positioned ourselves in the middle of everyone and moved with them. We were really obvious, which meant that people could avoid us if they wanted to. This was really important, as it gave everyone the chance to move away if the camera made them feel uncomfortable. Surprisingly, I had to do very little editing to the final photograph. The colors were so extreme, and the lighting was perfect under the trees. I cropped in a little from the original, pulled down the highlights a bit, and desaturated the reds a little, which I do on every photograph from this camera, as I find that my D800 shoots with a slight red tint. Thom is a documentary portrait photographer based in Cape Town, South Africa. You can follow him on Instagram, Twitter, and Facebook. He travels for the love of people and our shared humanity.